Glitter and shine and confetti! Fabric and vinyl and zip! 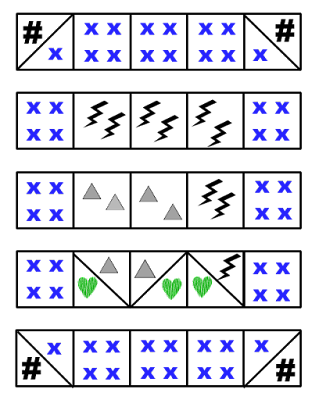 That's what Laura's new pattern is made of. 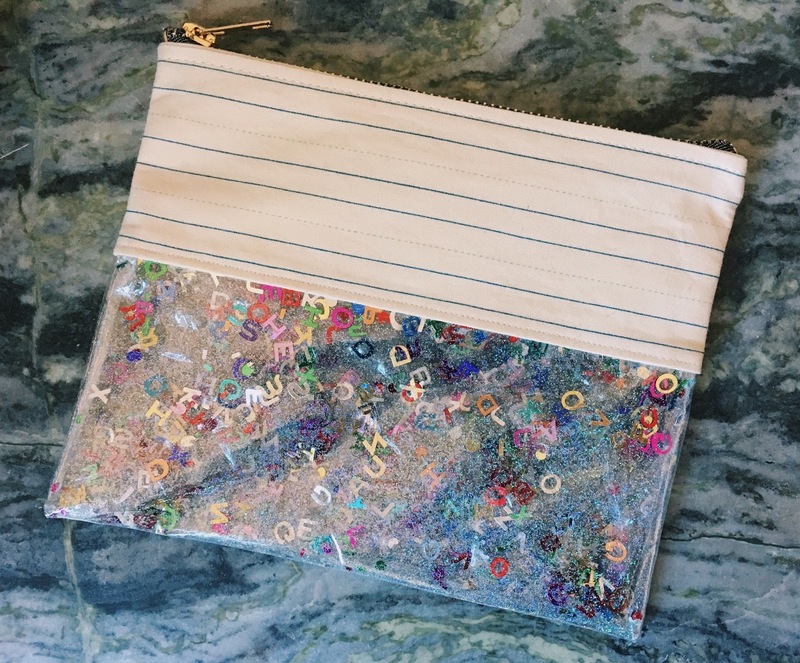 The Glitter It All Pouch is so good. One of those makes where you smile through the whole process. It is so fun and the clear instructions make it simple and quick to put together. 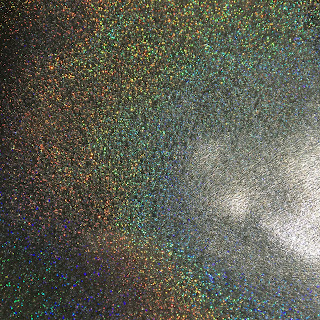 I mixed in some fine holographic glitter for extra sparkle and I had the perfect print to go with it, probably now unavailable as it is a couple of years old, Practice your Handwriting in Manilla Apple, School Days by American Jane. I probably went a little overboard with the glitter, it would be more transparent has I used less but then I did shake it up to take these photos, the glitter freely moves around. I can't stop shaking it! These would be such great gifts for kids, teens or any one that likes sparkle! 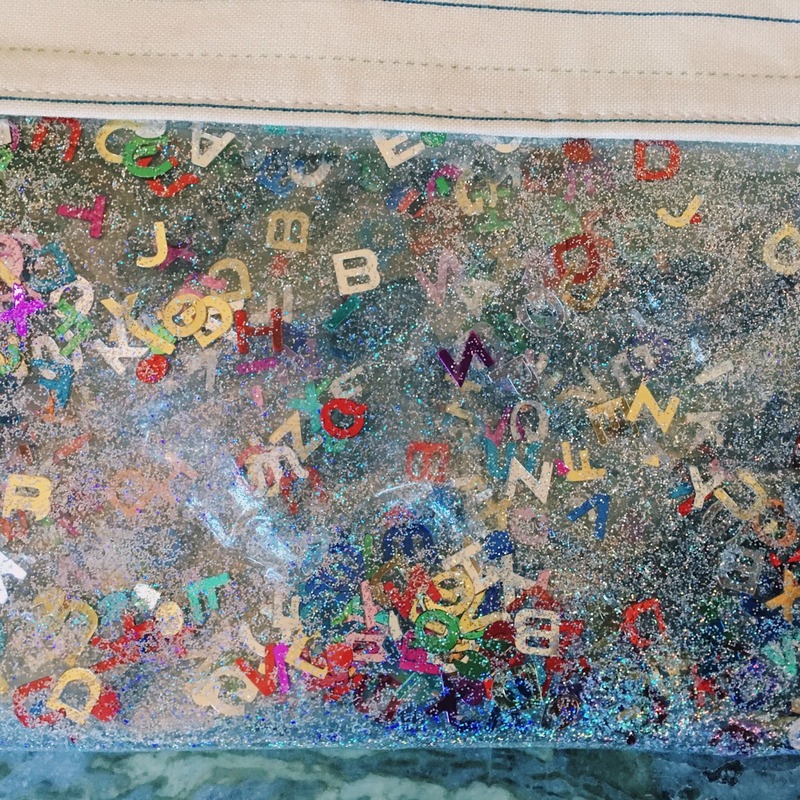 You can get so many different types of glitter and confetti - you can find stars, hearts, flowers, smiley faces, Christmas, Easter, numbers, unicorns... the list goes on (and that was just a quick Google for metallic confetti!). 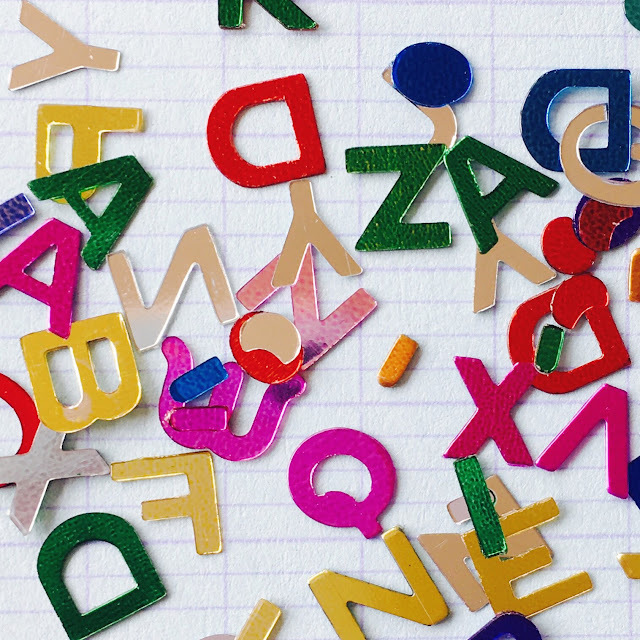 You don't even to have to buy confetti or glitter, remember the joy of emptying a hole punch? 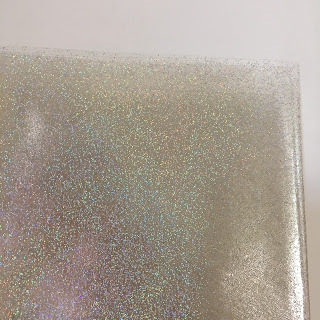 If you have any shiny card or even just different colours (it doesn't have to sparkle! 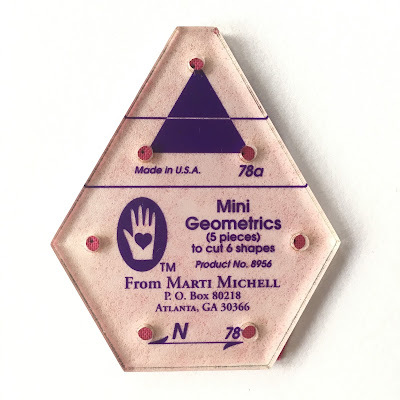 ), you could hole punch to your hearts content and use those shapes. Get creative and play! 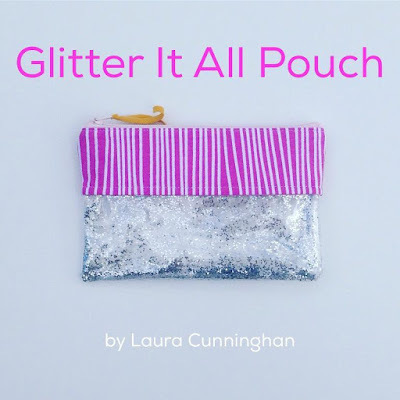 You can download Laura's free Glitter It All Pouch pattern from Craftsy now! I just couldn't help myself!! 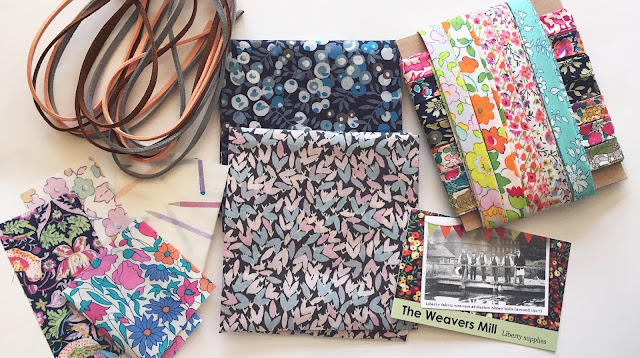 Another beautiful package from The Weavers Mill and more scrumptious Liberty. The addiction is real. 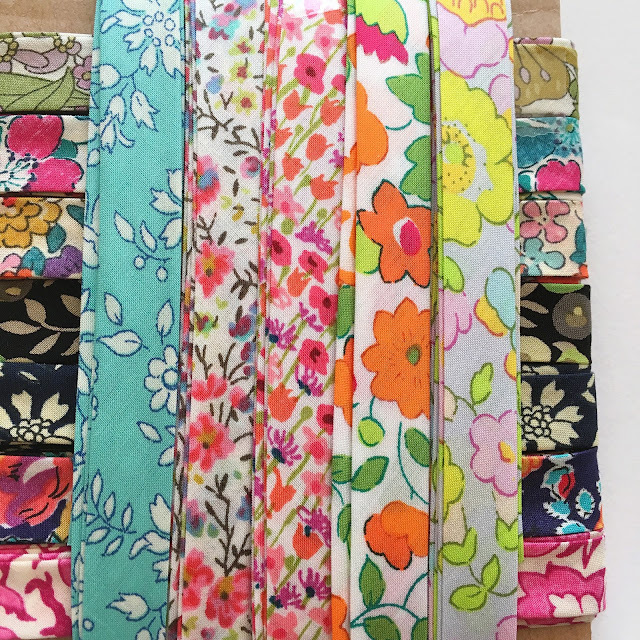 I bought 3mm flat faux suede leather cord in light grey, brown and pink2, a square of Wild Perennial A (the bottom fabric) and Wiltshire B (as part of her Thank You offer), some lovely free scrap pieces and a great selection of Liberty bias binding because I have plans!! 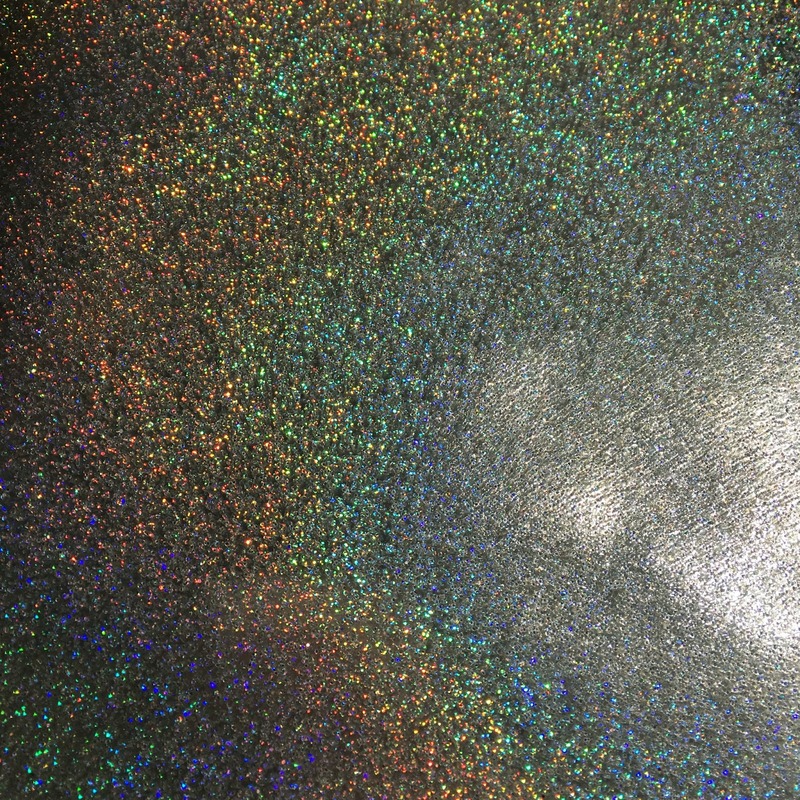 Next I got some very cool holographic glitter vinyl, impossible to take a good picture of but it's amazing! 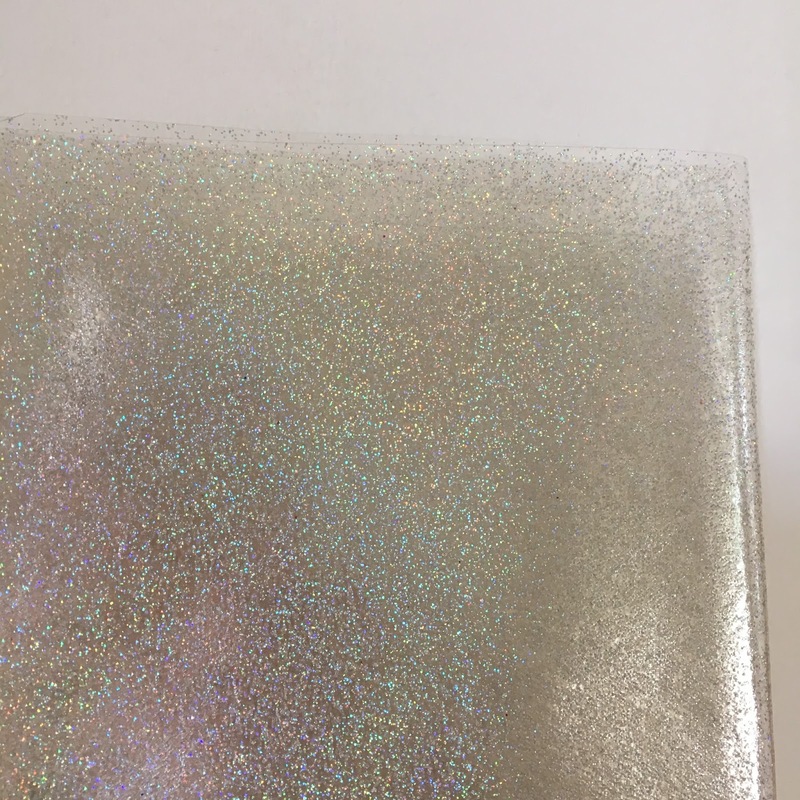 An Ebay find, click here for the listing - it is the silver glittery option. 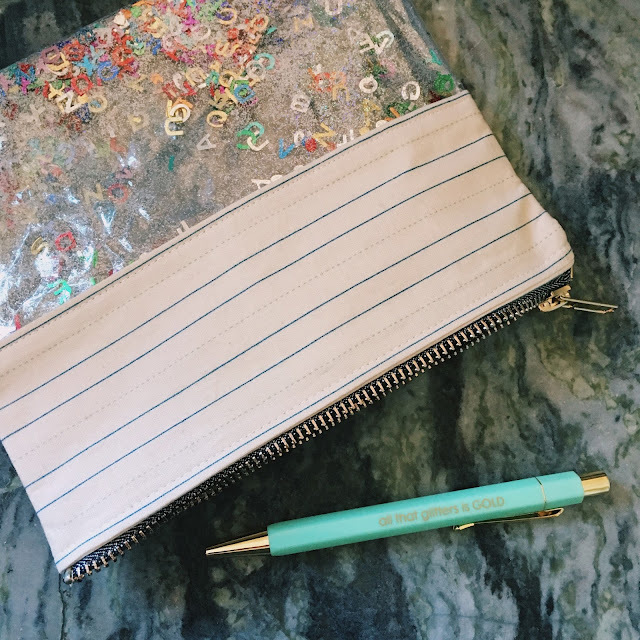 I may have mentioned it before but I have big love for stationery! 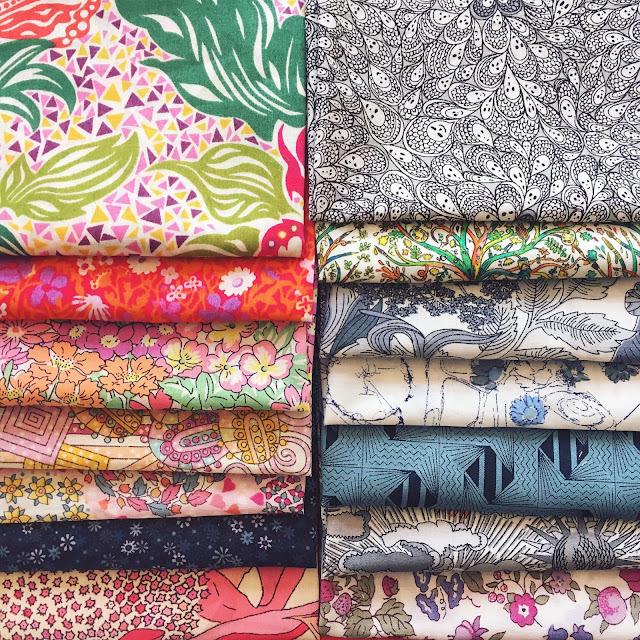 Depending on my mood it's a close call between stationery and fabric as my favourite thing. 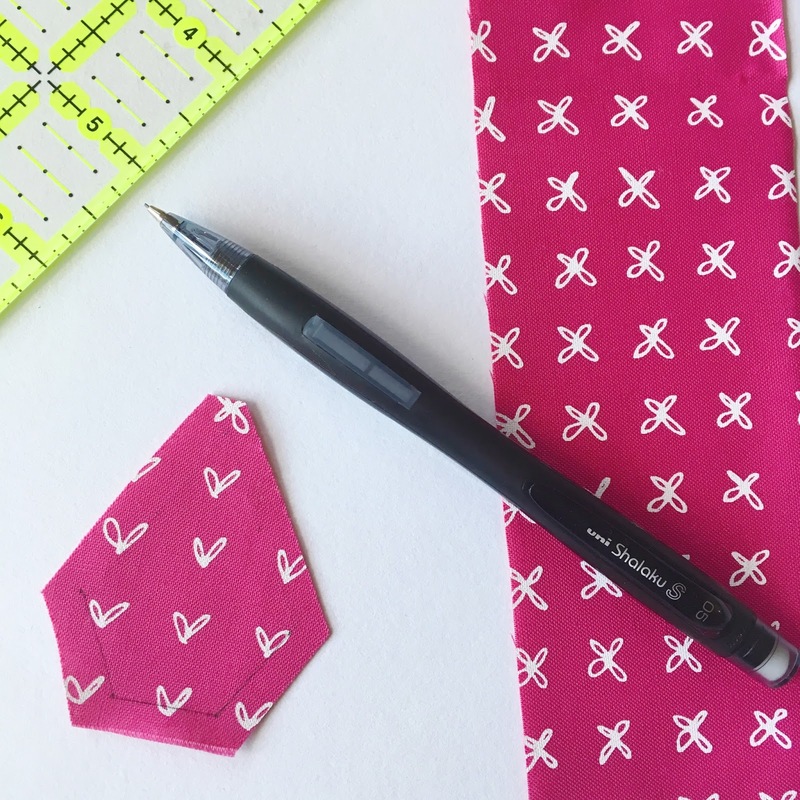 There is joy in using quality pens and pencils, especially in my sewing projects. Today I am sharing some of the uni-ball range and showing you how I have been using them. 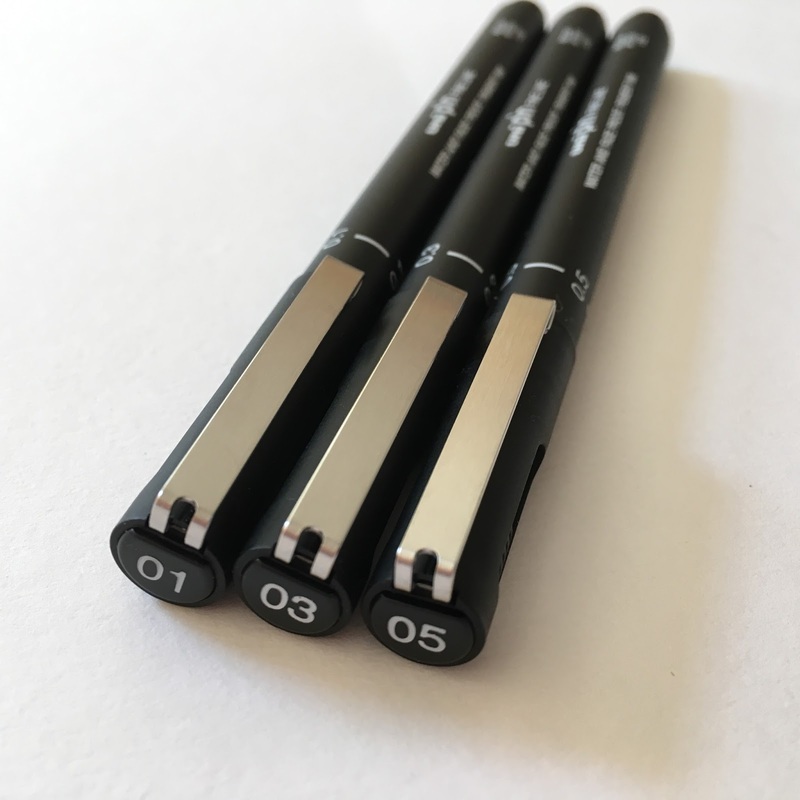 The Shalaku mechanical pencil is the most comfortable pencil to use with a really cool button on the side to easily adjust the lead, a nice grip and a clear fine line. 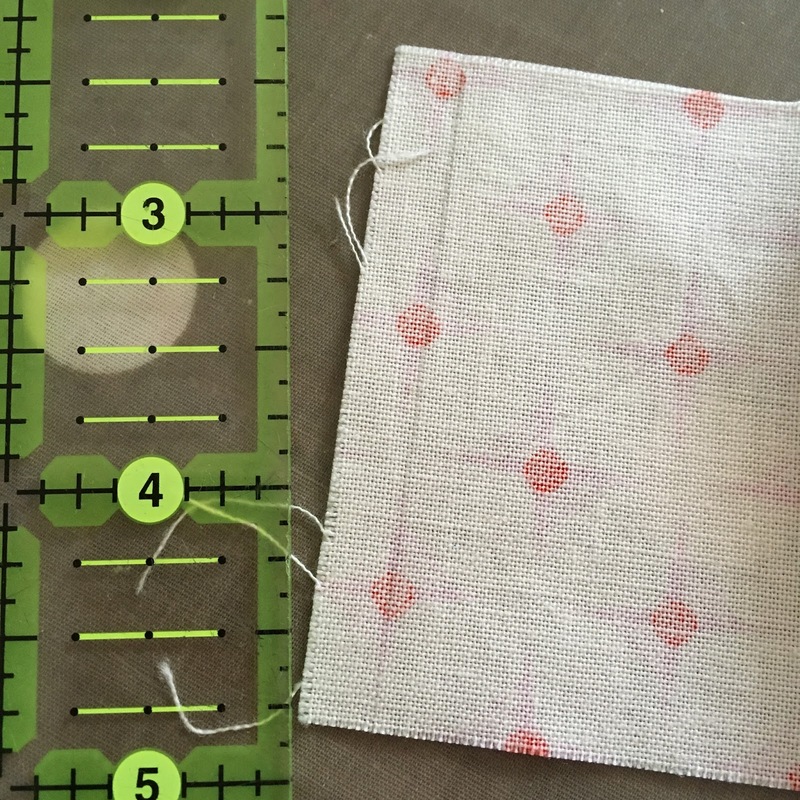 I have been using it for hand piecing and it draws so smoothly on fabric! I usually use a washable ink fabric pen but I am converted to the pencil side now. 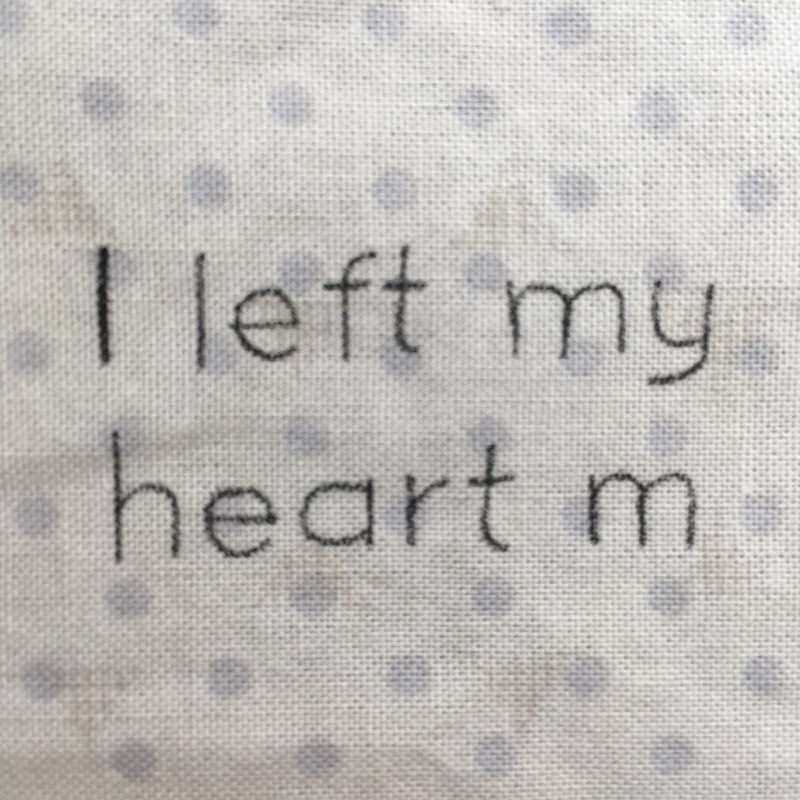 It also can be used for marking out appliqué shapes and I noticed how well it blends in when I did some needle turn appliqué. Next I wanted to experiment with using uni-ball Pin drawing pens on fabric because they have fade and water resistant ink. I used the Pin 03 to create a label for my latest mini quilt and tested by writing it out once and going over it, then another one (after messing up!) which I went over twice. So on the left pictures below it was written once but the 'I' twice and on the right pictures it was written three times. Dry and much improved! 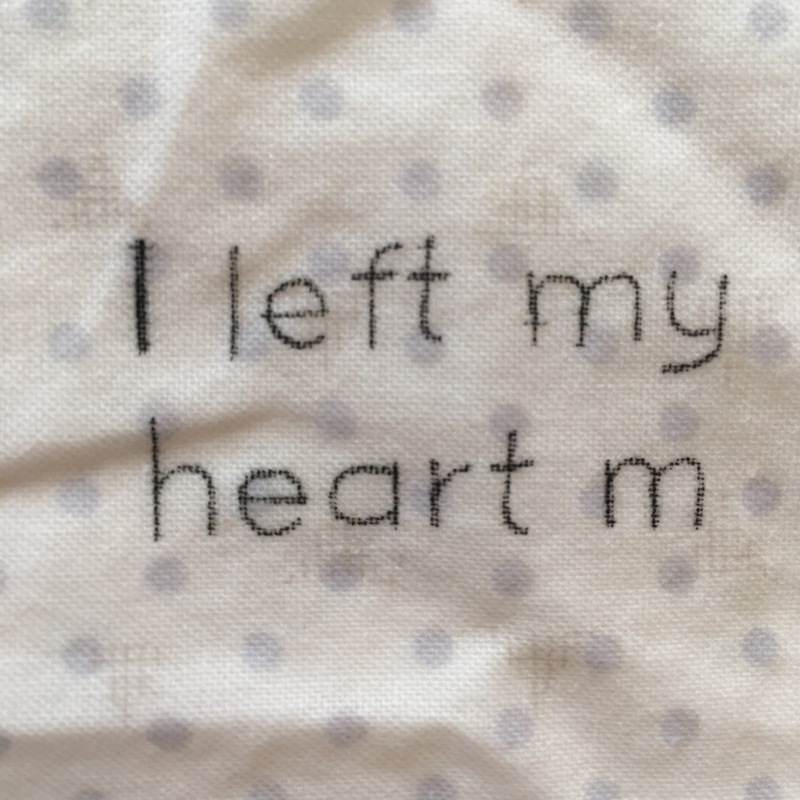 There is still a bit of bleed but the words written once or twice were fine. I think writing your label and then going over the letters once is perfect, three times is too much ink! Next up I had some crafting fun with the kids using Posca markers. 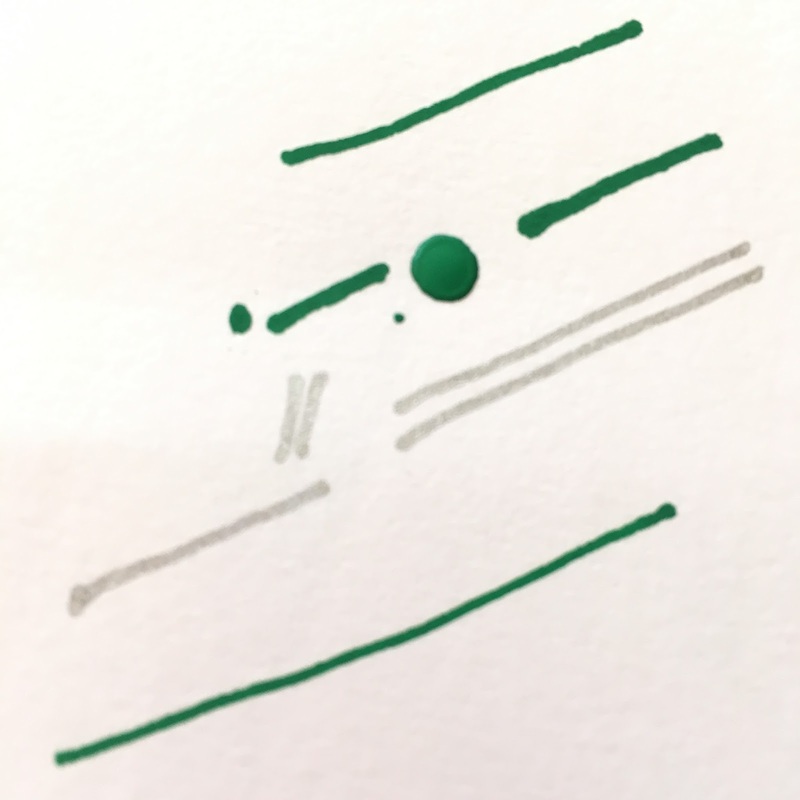 We had a couple of different sizes and colours to play with and they draw beautifully, I especially like the metallic ultra fine Posca markers. They also wash off easily, which is fantastic when you have three kiddos making all kinds of mess!! 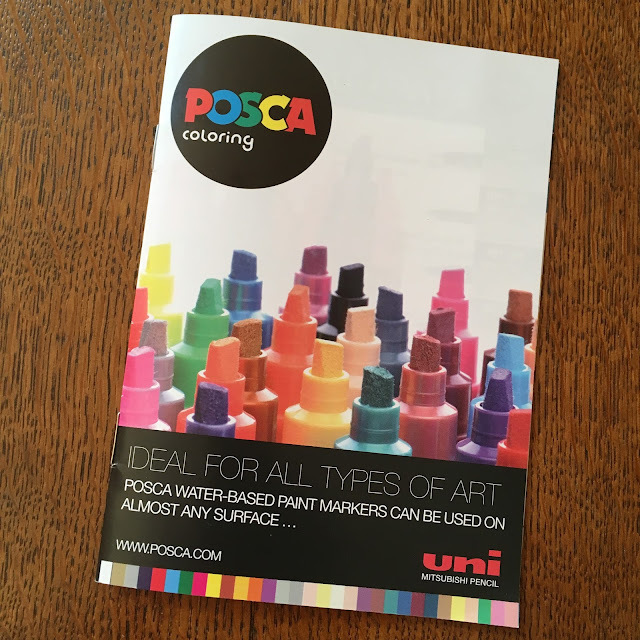 My children love Posca markers because they aren't 'kids' pens and they like to be proper artists. I tried them out on glass and enjoyed experimenting, super easy to clean up your design or wipe it all away with a baby wipe. 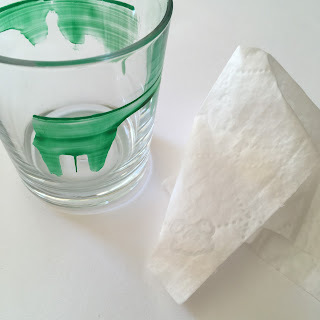 It takes some work to get the colour distributed how you want and build up layers but there's loads of scope for being really creative and personalising glasses and mugs and more! For me I am definitely sticking to using uni-ball pens and pencils for sewing, writing and designing projects. 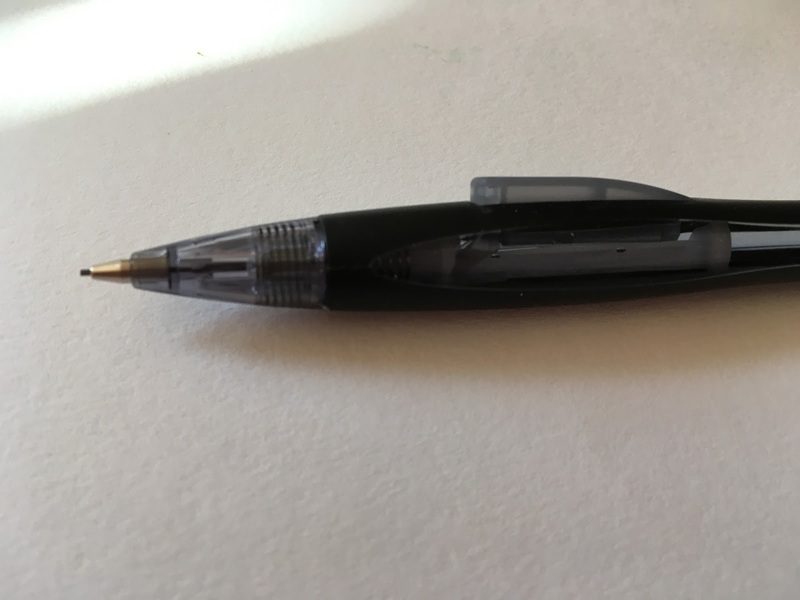 The Shalaku mechanical pencil is a favourite and the uni-ball Pin fine line pens are welcome additions to my sewing arsenal! 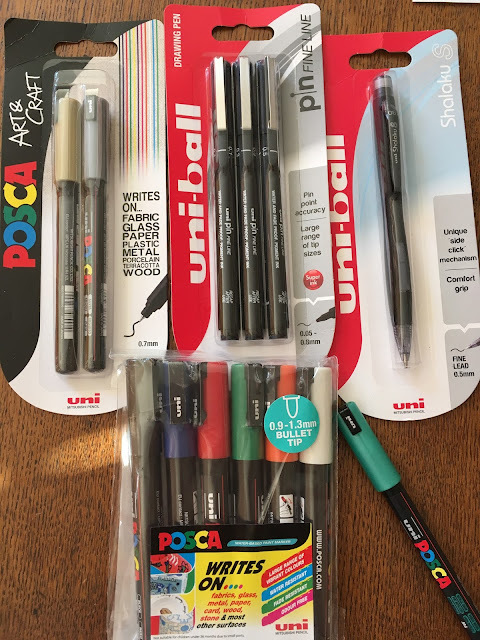 Uni-ball kindly sent me these items to review on my blog, all opinions and times spent crafting with abandon are my own. The uni-ball products mentioned are available in the UK at most supermarkets, WHSmith, Ryman, online from Cult Pens or to buy online from Amazon click here. 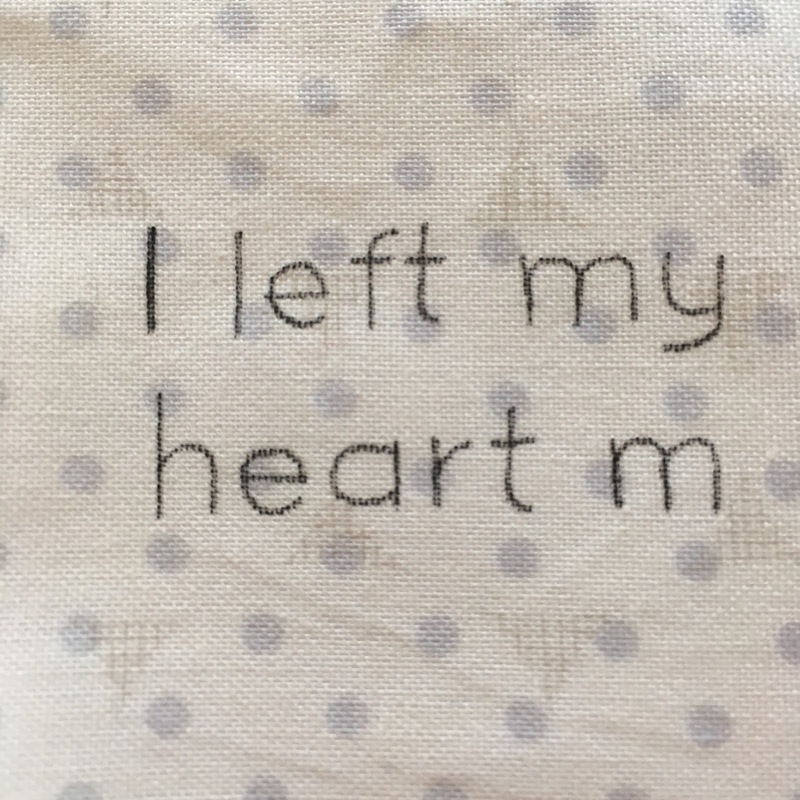 I left my heart in Colorado is my pattern and tutorial for the Marti Michell Mini Quiltmania. There was an emotional journey taken in the making of this quilt but the beauty of the pattern is you can totally make it your own, perhaps inspired by a place or person that is special to you. The wonderful Angie of Gnome Angel has gathered an amazing group of bloggers to provide you with free mini quilt patterns over 13 weeks. We are all using the Marti Michell Perfect Patchwork Template Sets A, B, N, D and S - the same sets that can be used for the Farmer’s Wife 1930’s Sampler Quilt Sew-along. 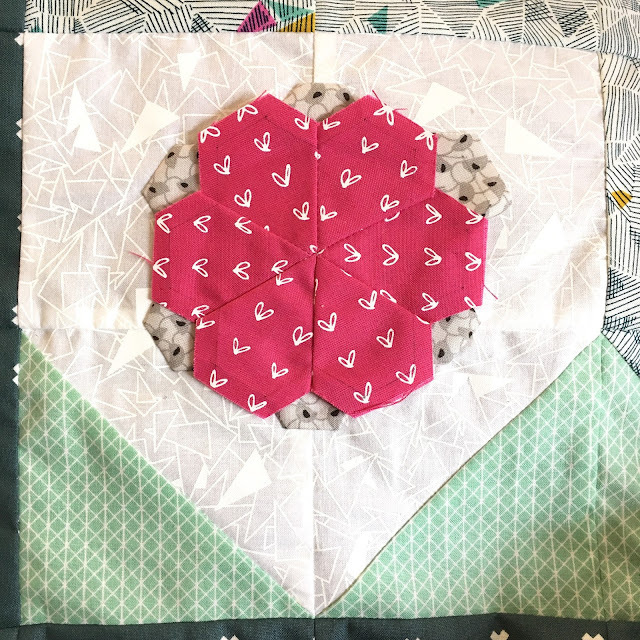 There will be a wonderful variety of patterns and inspiration to use the templates so that you can create your own mini quilt and link up, with the chance to win prizes! You can see all the details at the end of this post. 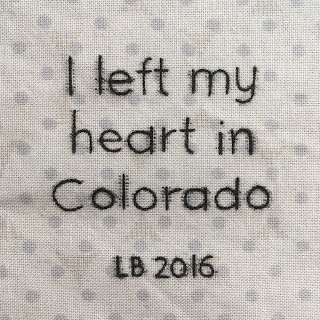 My mini quilt is like a snapshot, framing the mountains and wildflower. It is a simple design with squares and triangles enhanced with appliqué and hand quilting. 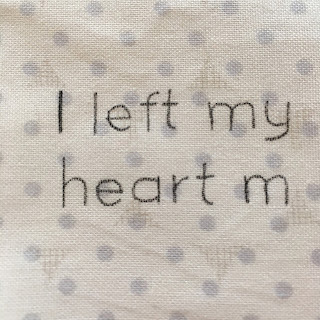 I knew I wanted to create a pretty picture, what I didn't realise until I started sewing was how much of me is really in this quilt, It became so clear after Kim of My Go-Go Life left a comment on my instagram about how she purposely adds "ME into what I am creating". 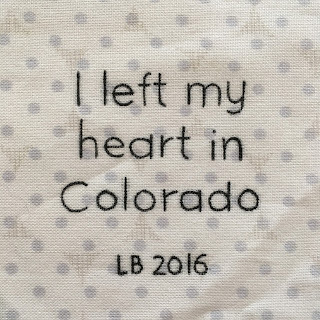 Boulder, Colorado was like a second home to me growing up. We went to live there for a short while when my Dad worked at CU and spent summers there nearly every year after, until I was 18. I met a lot of amazing people, had great fun and made a couple of life long friends. 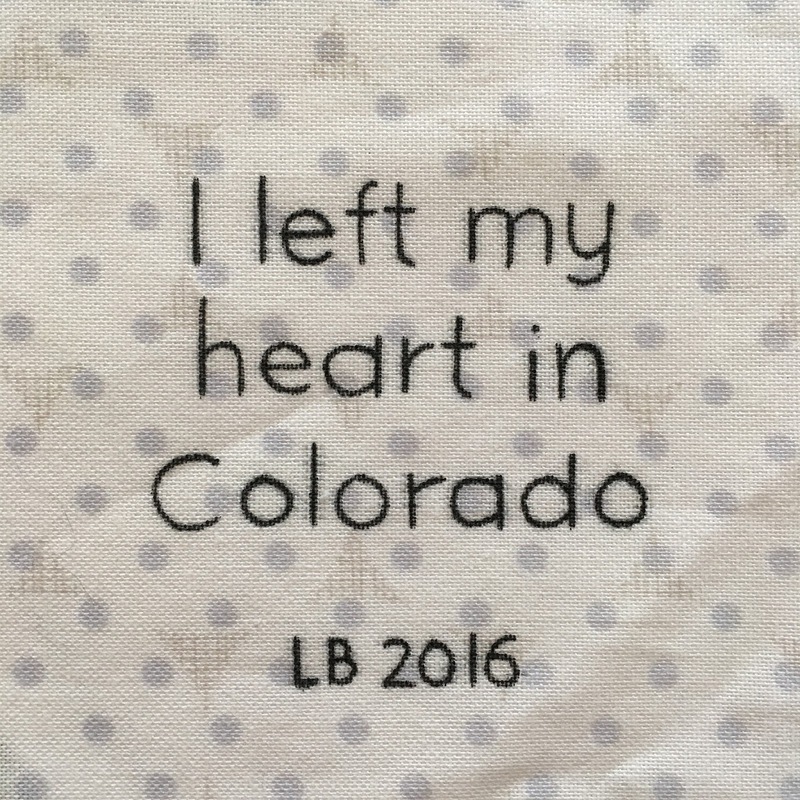 Tragically one of those friends passed away recently and I have been grieving hard. 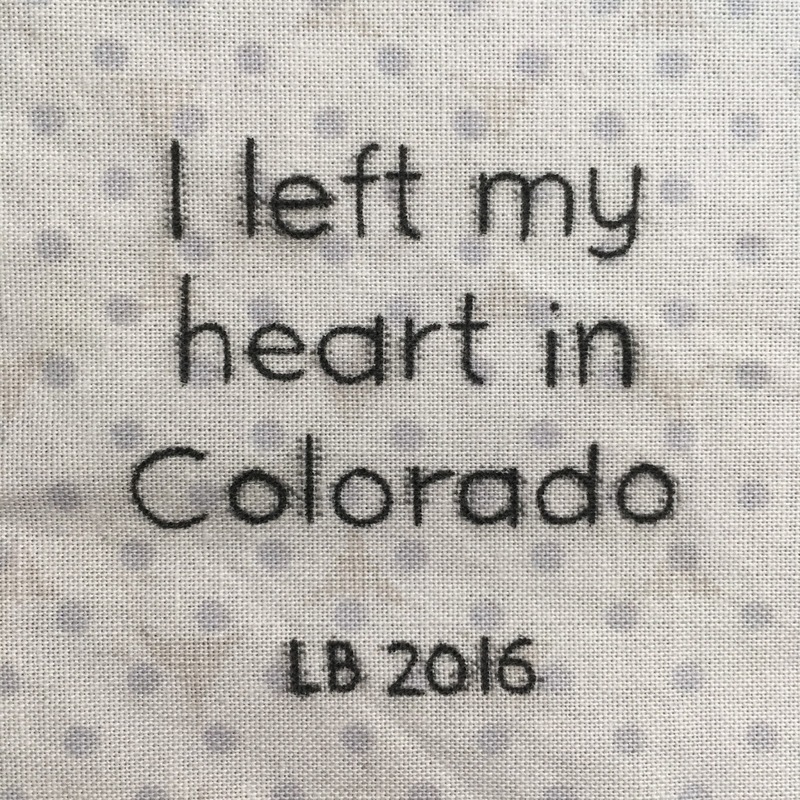 In a way this quilt is a small tribute to him but also a celebration of incredible memories and an immense love for Colorado. One day I hope to go back and take my family with me! Finished size: 20 x 20"
Fabrics used: Grid in Furnace, Behind the Scenes by Jen Kingwell; Half Moon in Peat, Behind the Scenes by Jen Kingwell;XOXO in Seamonster, Cotton and Steel; Netorious in Jam Jar, Cotton and Steel; Geometric Triangles in White on White, Sew Simple; Flower Bed in Valentine, Blueberry Park by Karen Lewis and Sketch, Cotton Candy by Susan Driscoll. 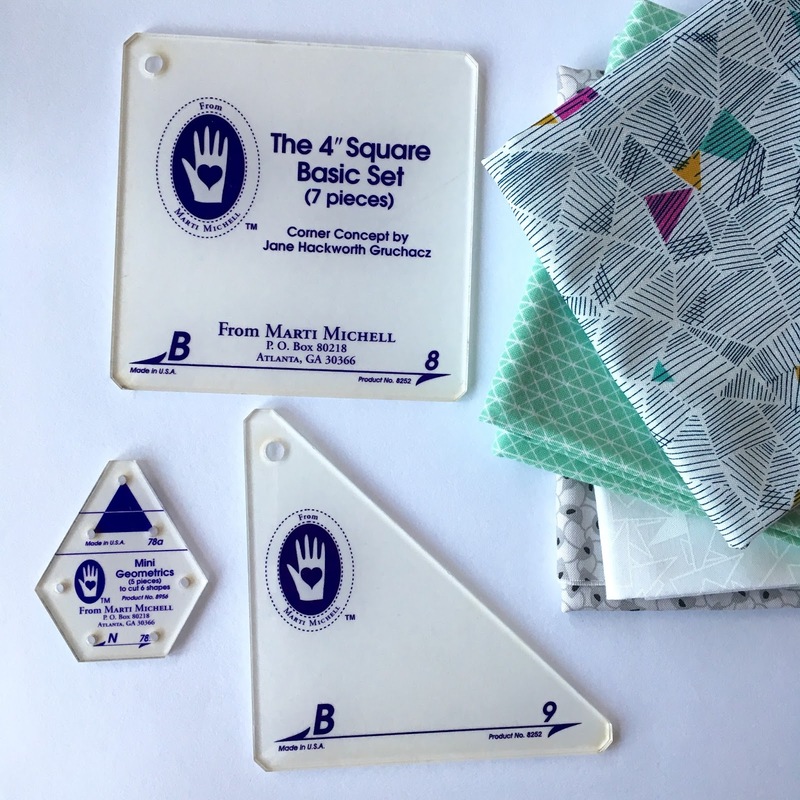 The fabrics I used were from Simply Solids and they are kindly offering a FQ bundle as one of the Marti Michell Mini Quiltmania prizes! 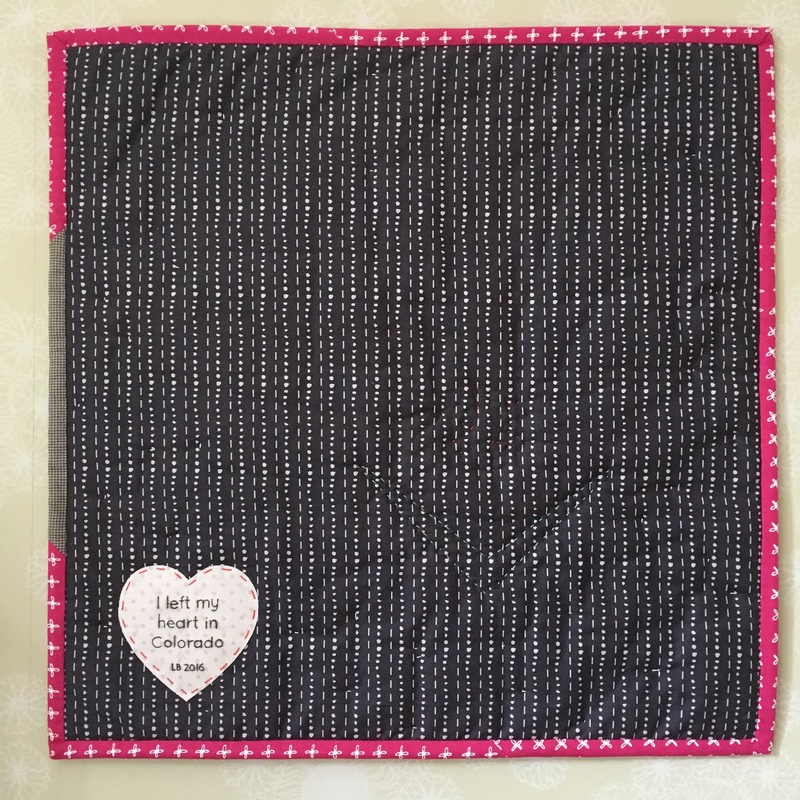 ⦁ Backing fabric - 23" x 23"
⦁ Wadding - 23" x 23"
⦁ Binding - 2.5" x 90"
I am also providing a colouring sheet, to download it click here. 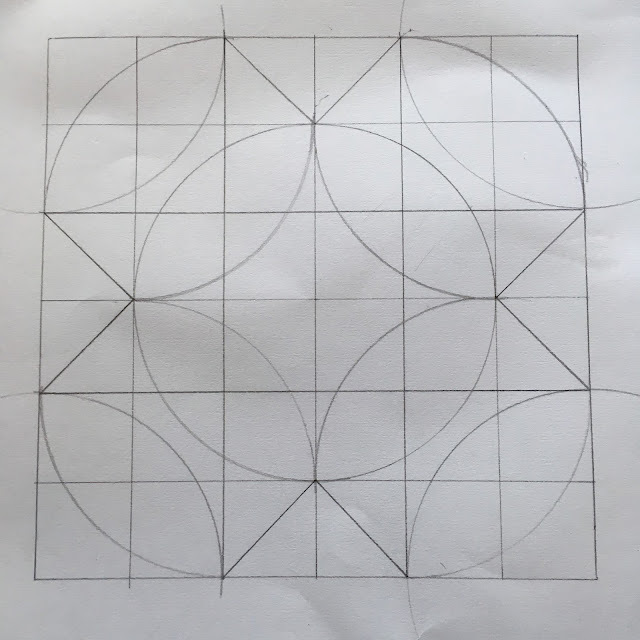 please refer to this diagram when cutting your fabrics, you need 5 fabrics for this part of the quilt top which are A-E. The appliqué flower is made up of two fabrics, a focal print and a 'background' print. Cut 6 x Marti Michell Template N78 from each fabric so you have a total of 12 'petals'. 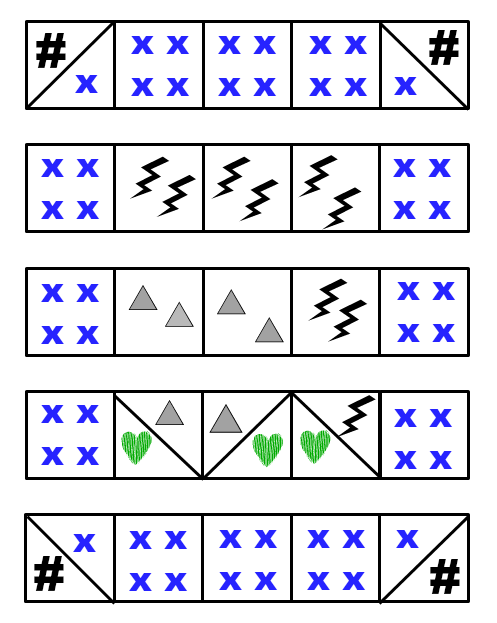 Refer to the diagram above or your colouring page and sew together all the pairs of triangles to make squares. Sew the petals together, you can do this by hand or machine. 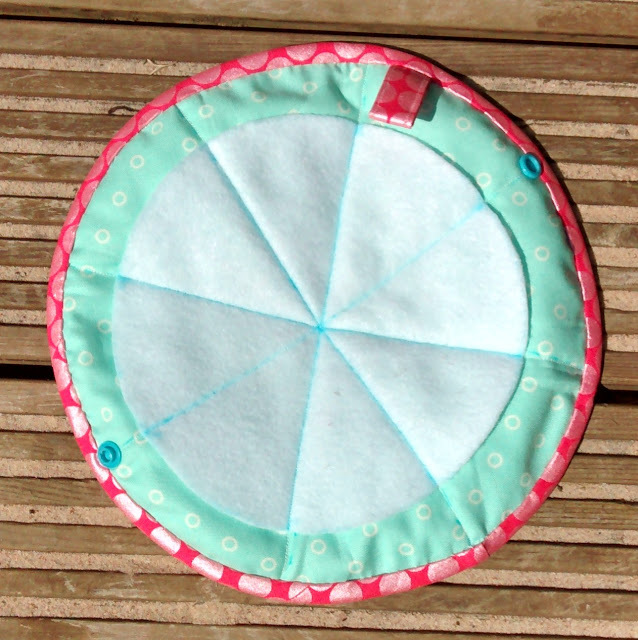 I find it works best to sew three petals together, repeat and then sew these two 'halves' together. 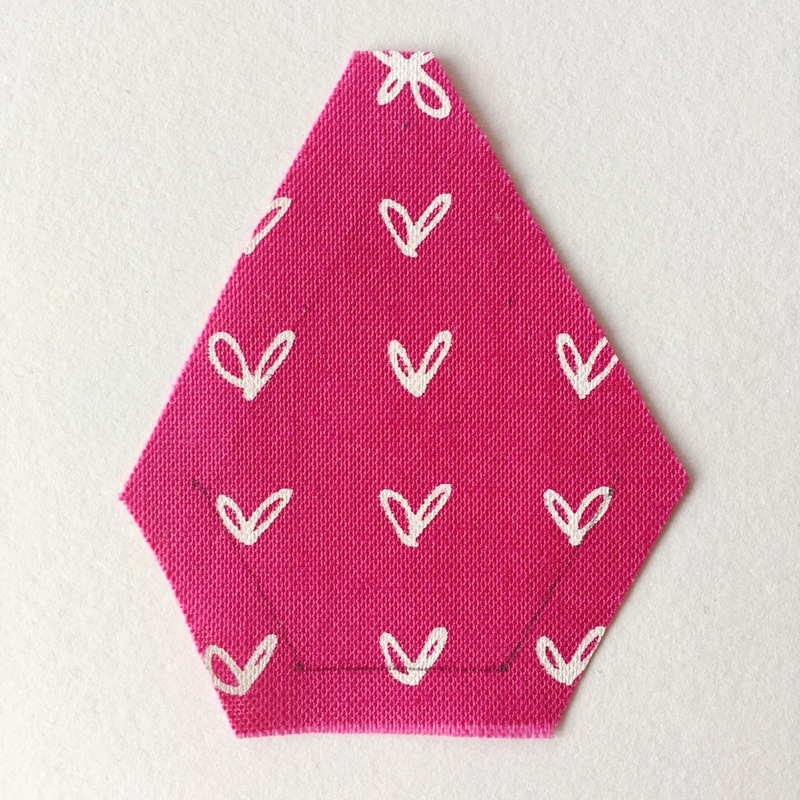 Arrange the six background petals in a flower shape, baste lightly using a swipe of fabric glue in the centres. Place your flower on top and baste in place, again just a couple of dabs of glue in the centre along the seams to hold it in position (alternatively, arrange the petals and flower and then pin in place). Stitch down the flower and petals using needle turn appliqué. I sewed the petals first followed by the flower. 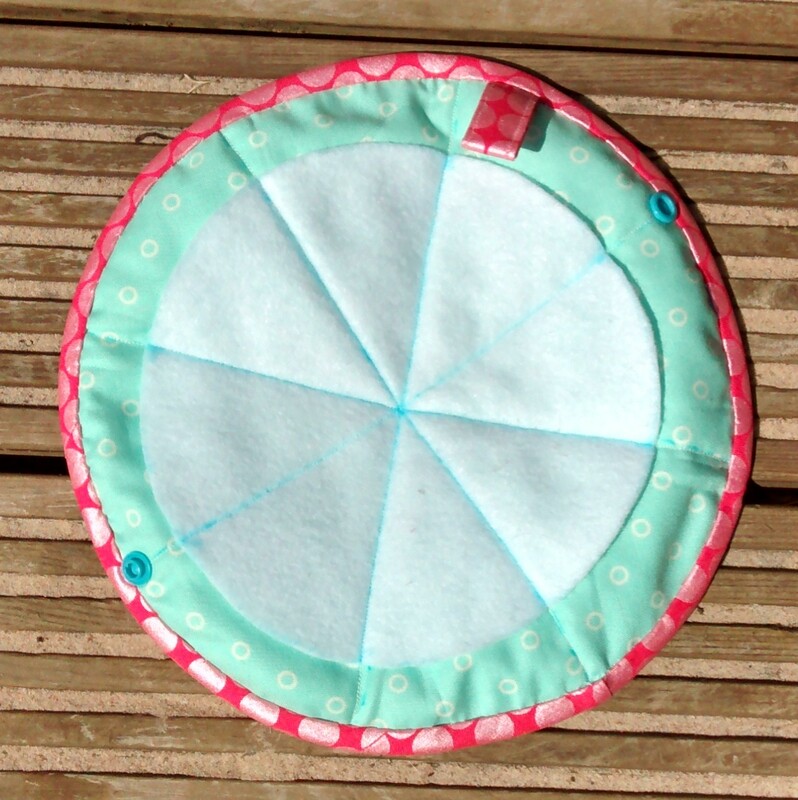 I used Aurifil 80wt thread, which is fine and disappears beautifully. It helps to have the flower in place over the petals so you can see how much of the petal needs to be sewn down. I like having the layers of fabric on the quilt top because it makes the flower more prominent. 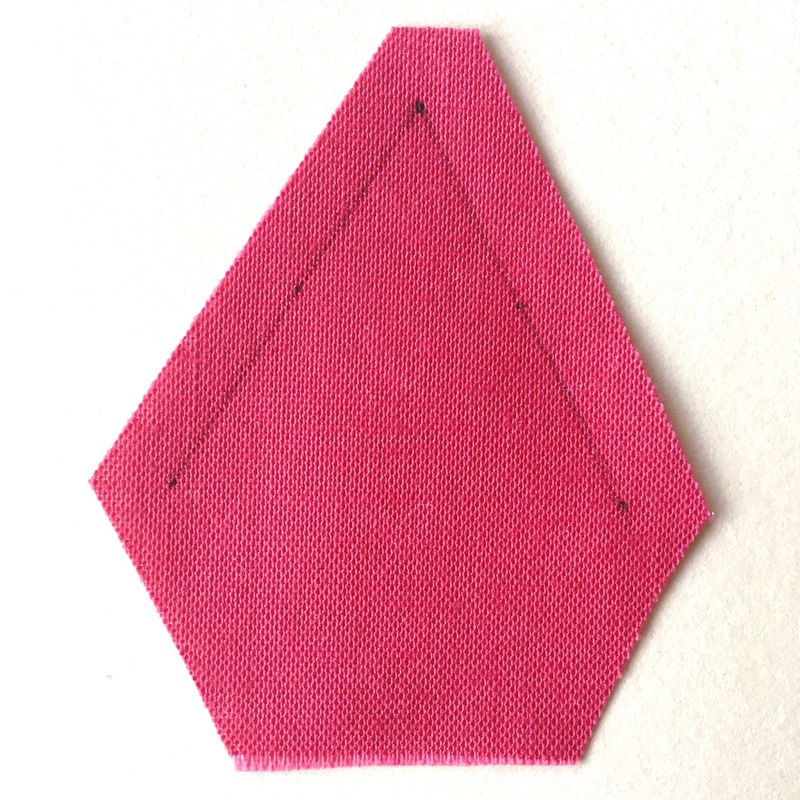 You can absolutely chose to make a different shape of flower, or not make a flower at all but applique something else. You can machine applique, do some embroidery, add some beads or tassels, add lots of flowers! 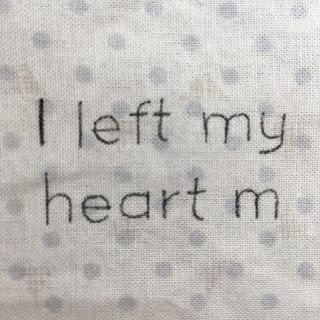 Really make that space in the centre of the quilt your own. Add some YOU into it! 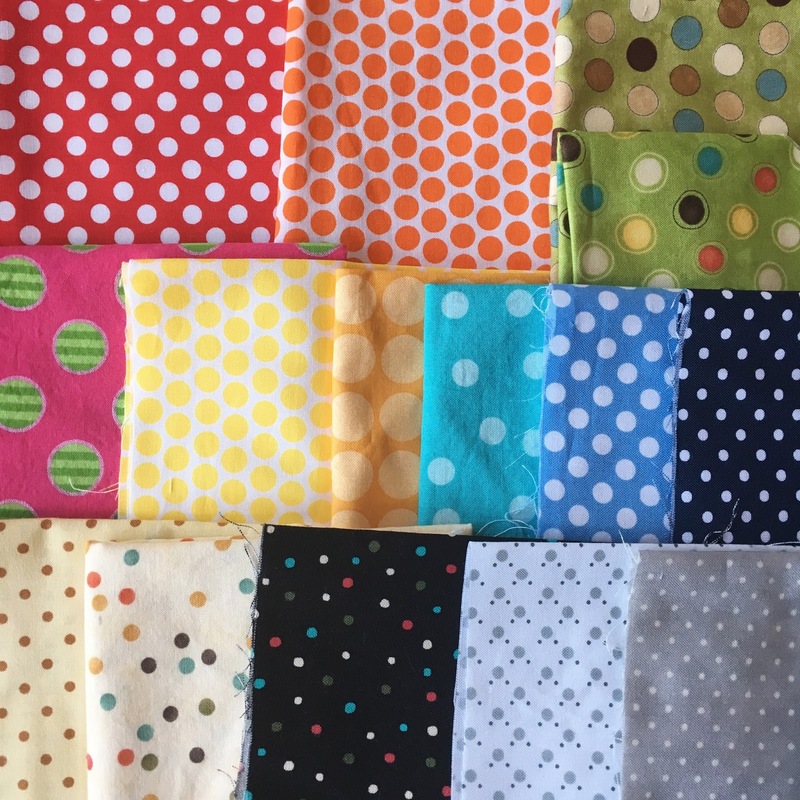 You are ready to layer, quilt as desired and finally bind the mini. 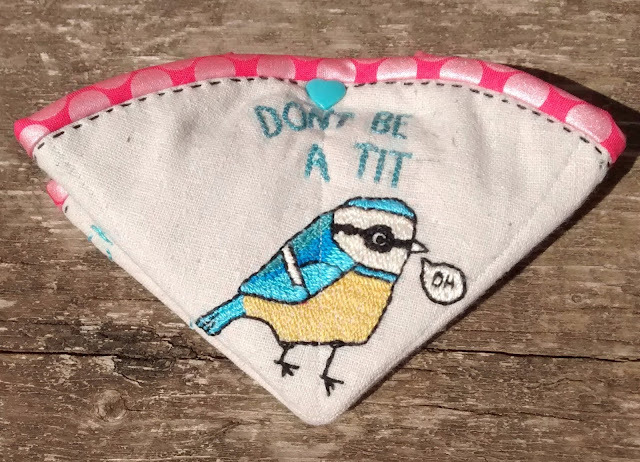 I hope you enjoyed the tutorial, if you use my pattern I would love to see your version! Please share a link to your picture in the comments below, tag me @charmaboutyou on instagram or on facebook. ✦ Make your own Marti Michell Mini Quilt and win! 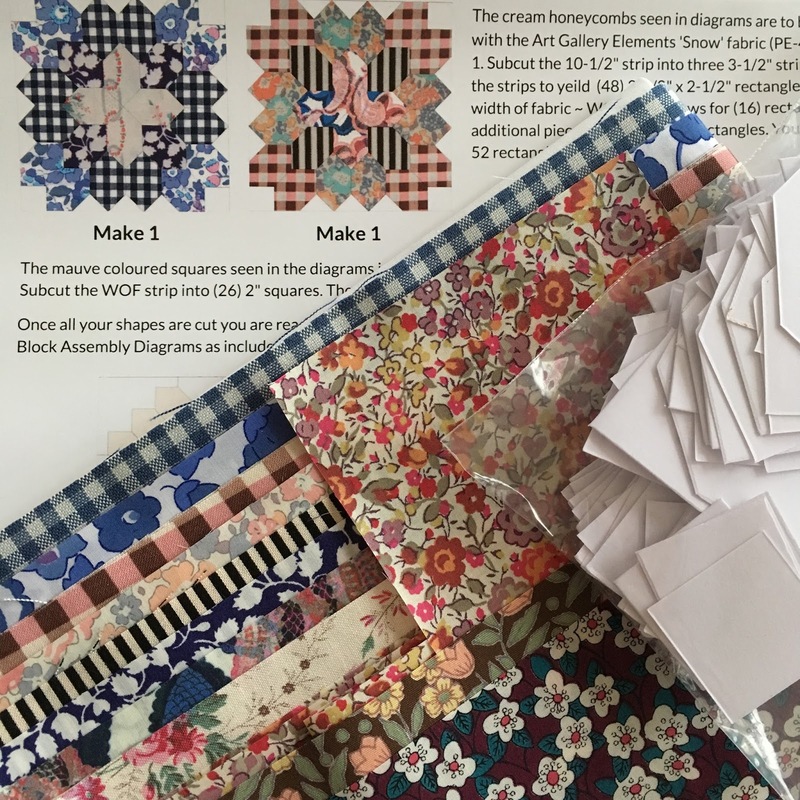 Create your fabulous mini quilt using any of the bloggers patterns and Marti Michell Perfect Patchwork Template Sets A, B, N, D and S.
On Friday 18 November all the bloggers will post a linky on our blogs. You can submit your photo via this linky. 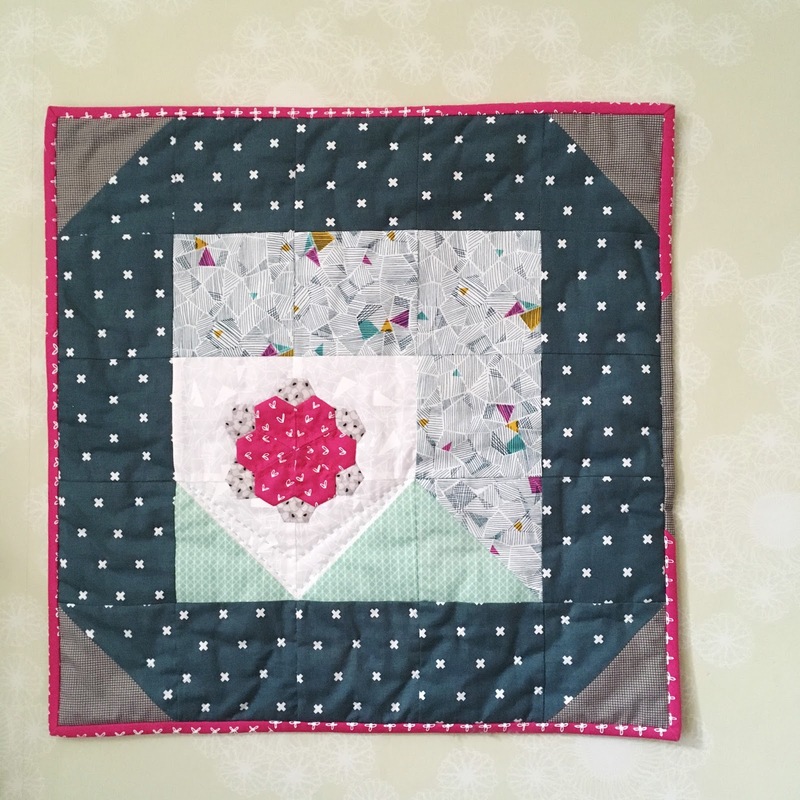 Alternatively you can submit your photo to the specific album in the Farmer’s Wife 1930’s Sampler Quilt Facebook Group or you can post it on Instagram with the hashtag #MartiMichellMiniQuiltmania and tag (@gnomeangel) and Marti Michell (@MartiMichell) in the photo. Entries will be open from Friday 18 November 2016 @ 7am AEST (Sydney Time) and close Friday 25 November 2016 @ Midnight AEST. It’s open internationally and winners will be announced on Wednesday 30 November at 7:30am AEST. Click here to read the full Gnome Angel post, to get more details and ask any questions. 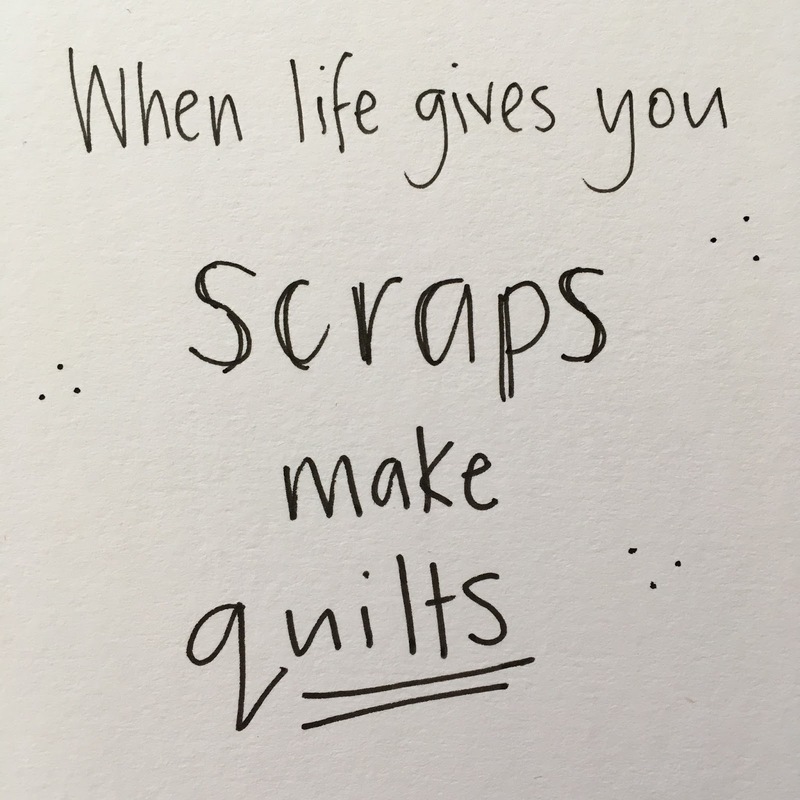 There is something so special about quilters coming together to inspire, learn from each and sew together. 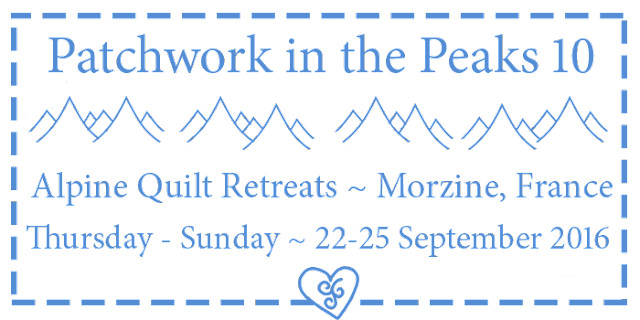 Even better when it's in stunning surroundings and I am super excited to share that I will be teaching at Patchwork in the Peaks 10! September always feel like a new start for me, as an ex-academic and now mother, it is the beginning of the school year and a time for fresh starts, setting goals and opening up to insights and creativity. 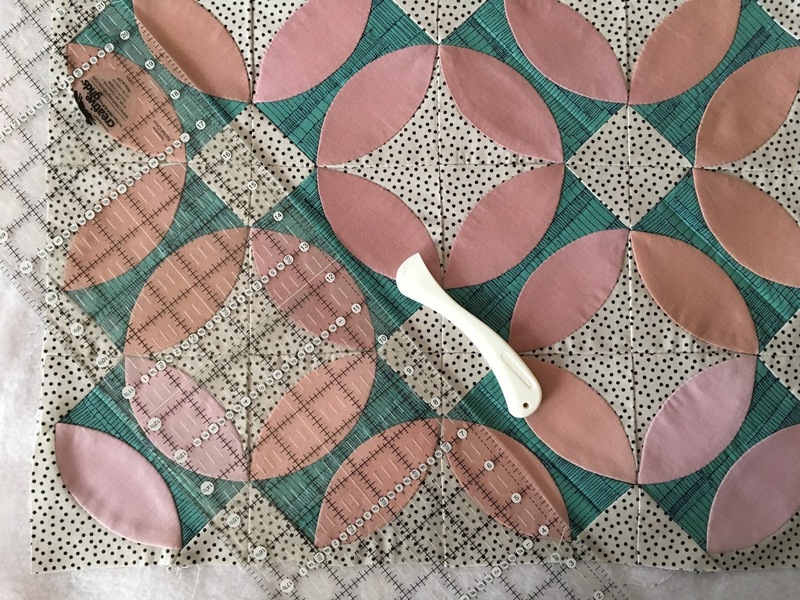 The lovely Elita of Busy Needle Quilting hosts this semi-annual quilter's retreat, a four day weekend in the French Alps. With classes and plenty of time to work on your own projects and relax in good company, it will be a rejuvenating creative get away. There is so much going on at the retreat and some lovely extras, like onsite shopping, massages and a nail service! 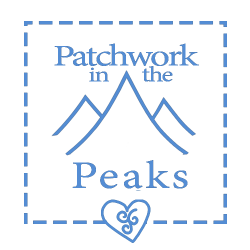 To read all about Patchworks in the Peaks click here. 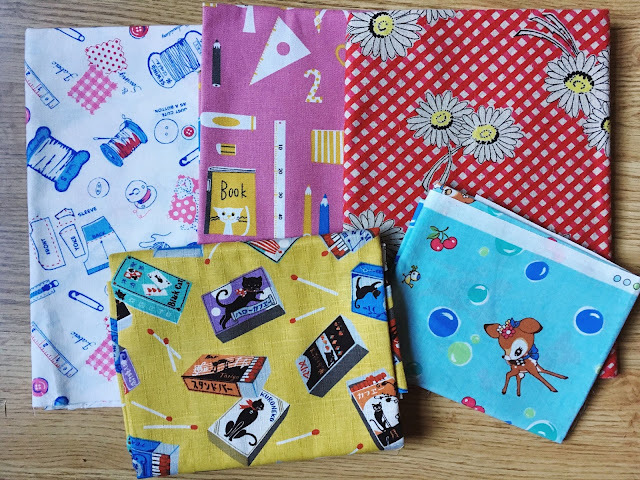 There are lots of exciting elements to the retreat; Secret Sisters - to provide encouragement, Finished Up Lottery - a chance to win a reward for finishing projects, and I am particularly looking forward to Show and Tell to see what everyone will be working on! 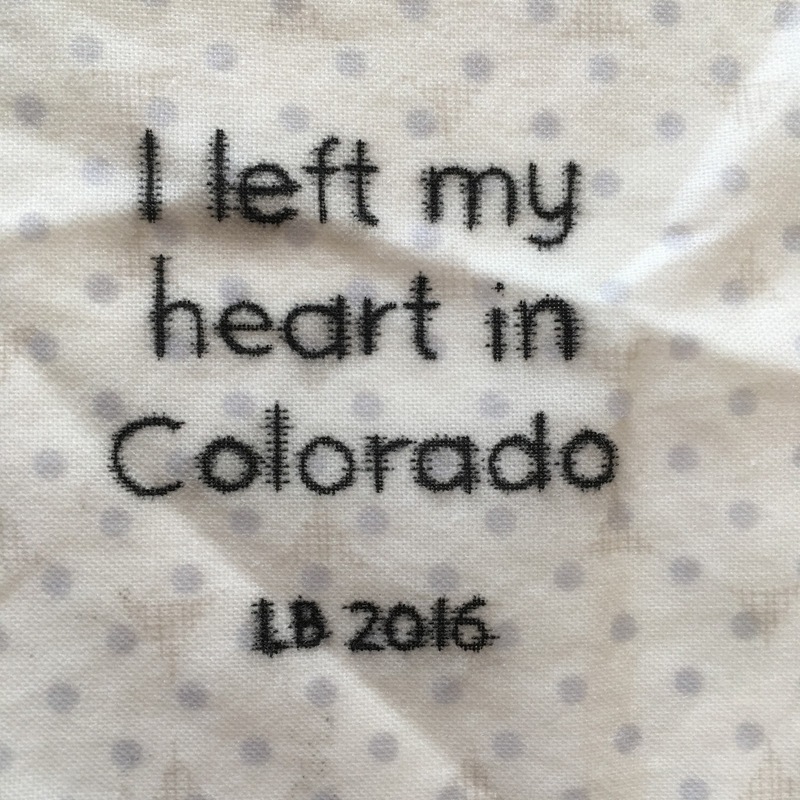 It looks completely blissful and I can't wait to meet everybody, do some sewing and enjoy the get away! If it is something that sounds good to you too, check out all the details and register now as there are few places remaining. My class 'Fussy Cutting Snapshots' on Saturday morning will focus on the fun of fussy cutting fabric. 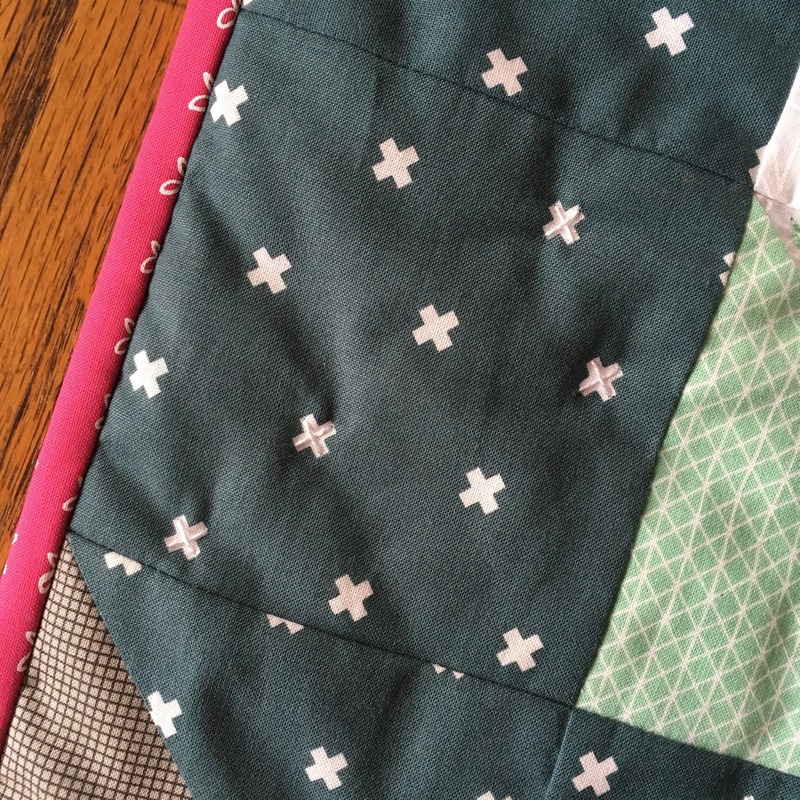 We will be making make some Polaroid blocks and also explore how you can incorporate fussy cutting into your quilts. I've been pulling out some favourite fabric in preparation. 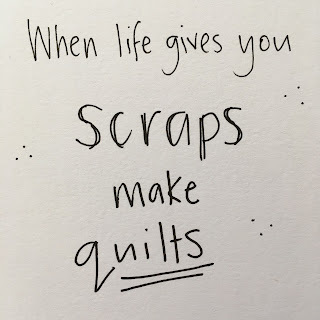 I am also thinking about what projects to finish on the retreat, I have a couple of quilts in mind! 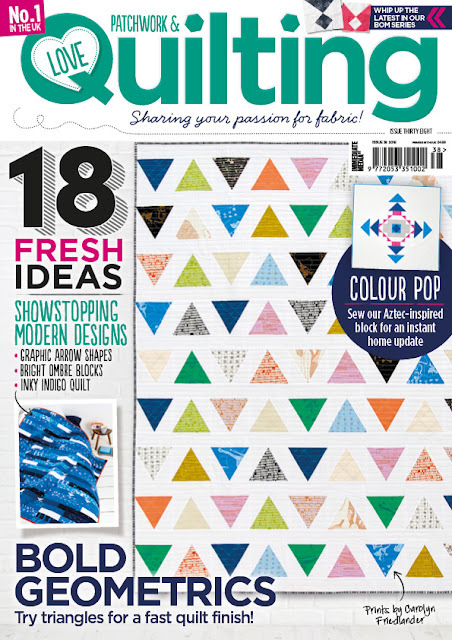 I am very excited to share my Trenton block mini quilt, which is featured in Love Patchwork & Quilting, Issue 38 - out today in the UK! 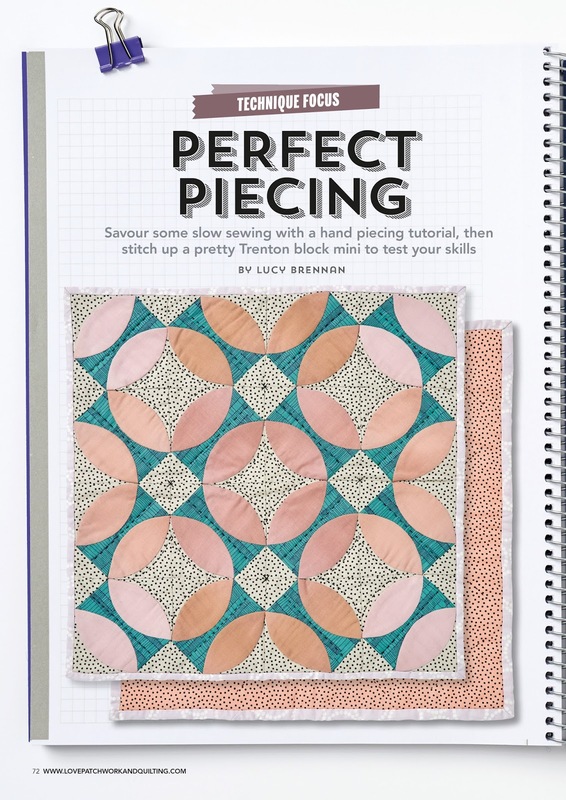 Hand piecing has become a passion of mine, I have a tutorial here on my blog and now a technique focus in Issue 38. I would really encourage you to try hand sewing if you haven't before. It's a nice change of pace from machine sewing and it's fun to be able to take projects on the go! I love making traditional quilt patterns with modern fabric and the Trenton block seemed like a cool one to try out. 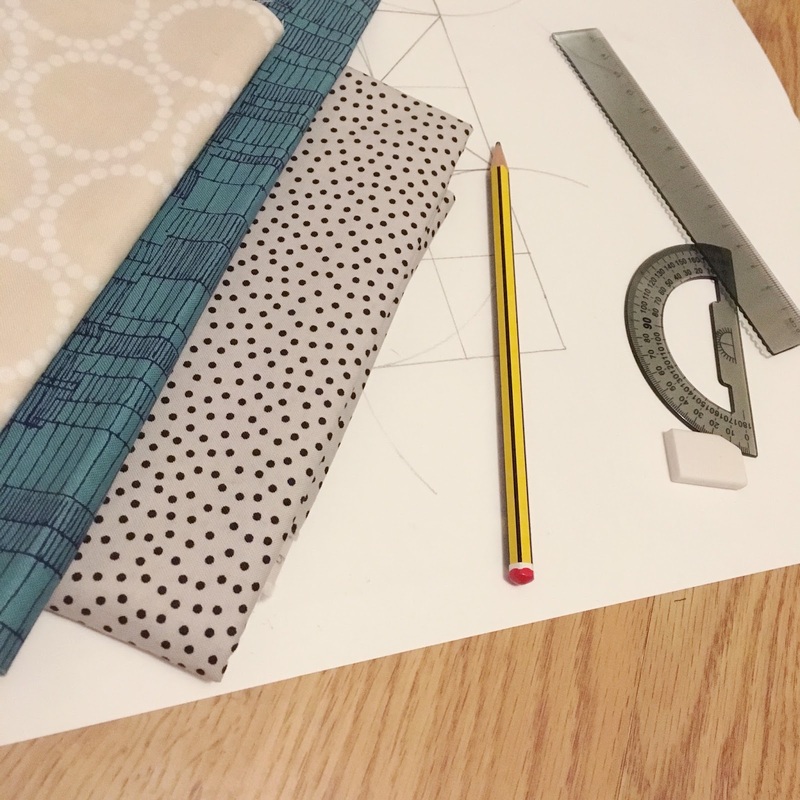 Curves are relatively easy when hand sewn and I have tips to ensure pretty points! It took me a while to get the dimensions right and I pulled out all my school stationery! The templates and a step by step tutorial with pictures, are in the magazine and it's really not a complicated sew! 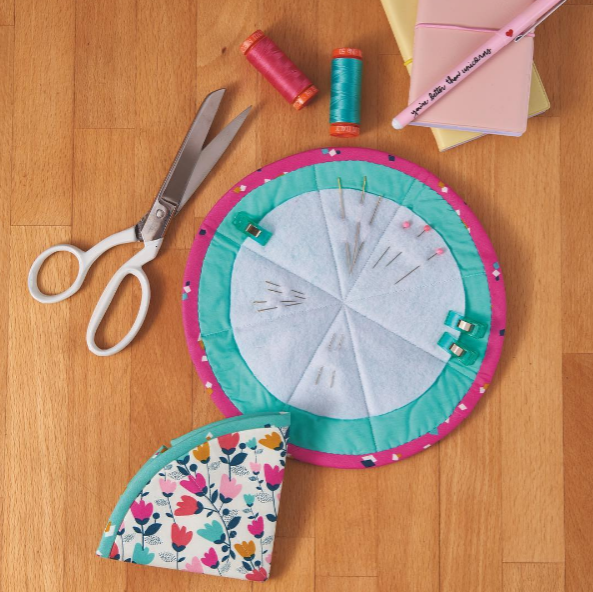 There are so many ways you could quilt this mini. 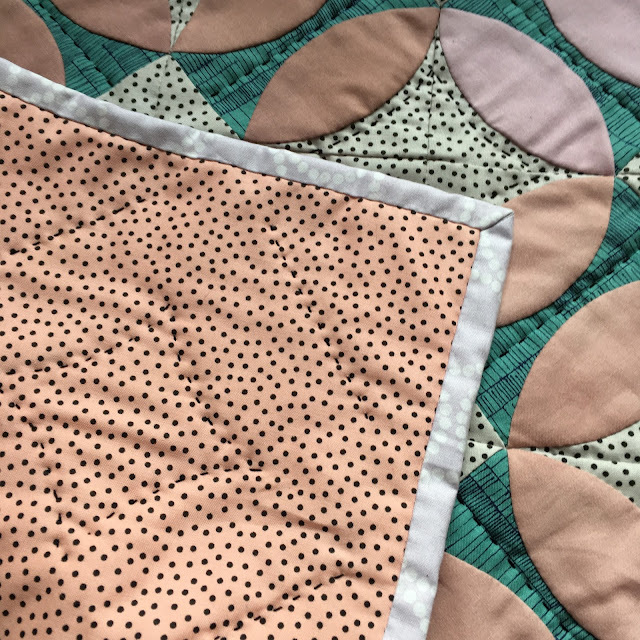 I chose to do some straight line quilting and echo inside the curves by hand quilting with black perle thread. 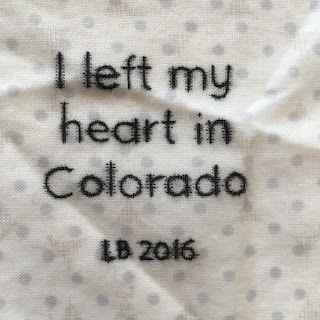 I also added a few cross stitches for fun. 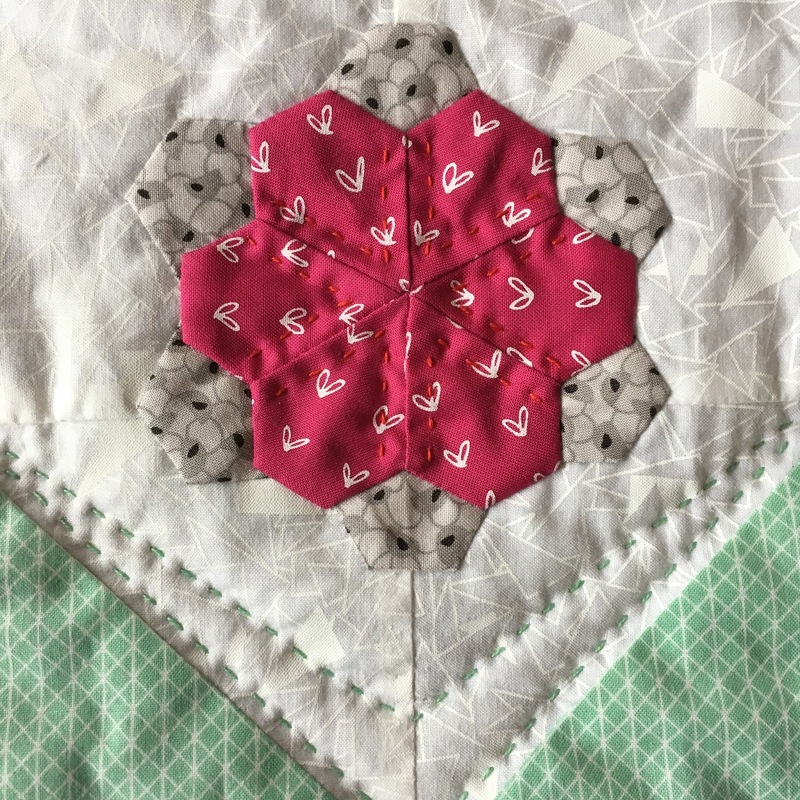 I really love the simplicity of the quilting, it works well with the fabrics and showcases the petal shapes nicely. 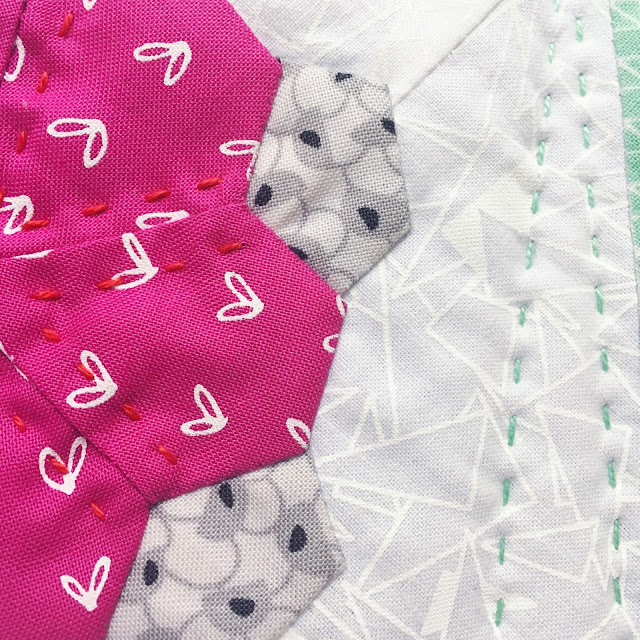 Also in this issue, the Love Patchwork & Quilting team used my pattern to make a couple of Stitchy Pie needle cases with Cotton Candy by Dashwood. 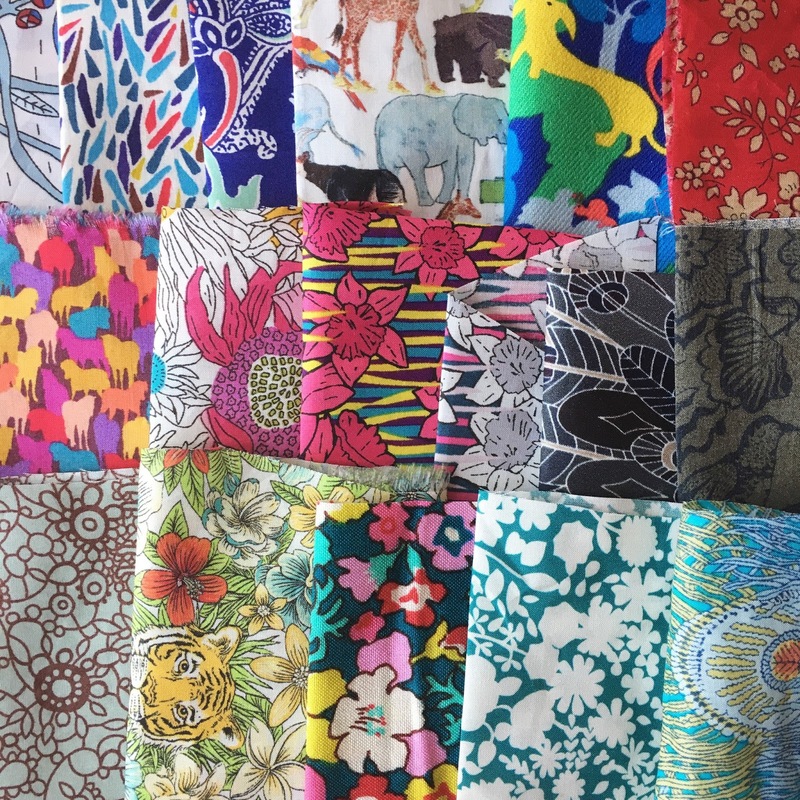 They are so pretty, love those fabrics! 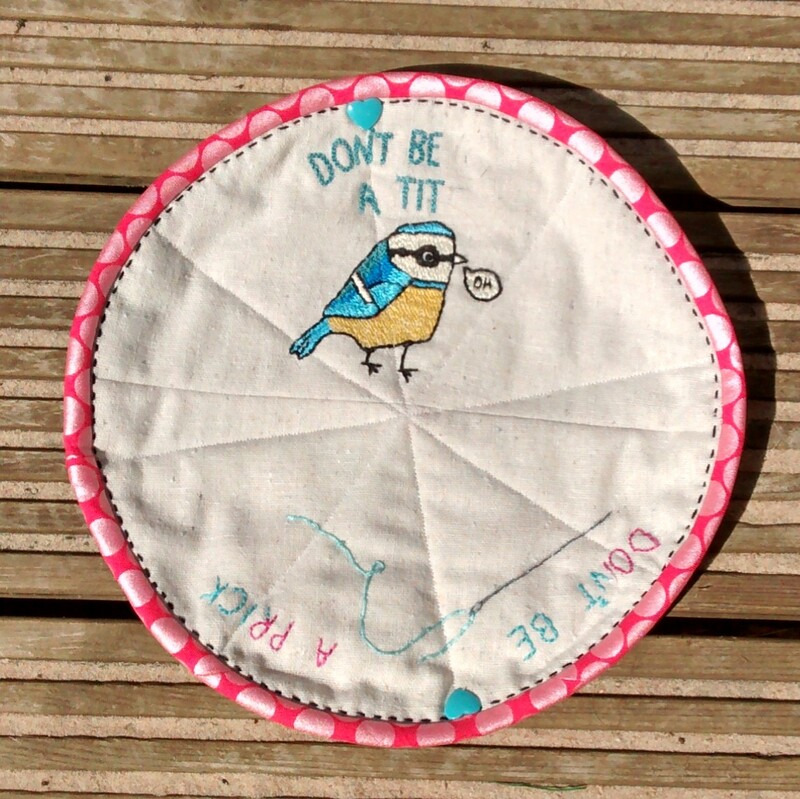 To purchase the Stitchy Pie pattern click here or visit my Etsy shop! I adore this so much and isn't her embroidery gorgeous?! She also cleverly added a loop inside so you can hang it up or attach it to something. Congratulations Martina! I have sent you an email. Tilda Autumn 2016 Ranges Blog Hop 🌹 & Giveaway!